Nicholine “Nicky” M. Iamaio, 97; of Fulton died Wednesday at Michaud Residential Health Services, Fulton. She was born in Fulton to the late Anthony and Rose Corsoniti. Mrs. Iamaio was a lifelong resident of Fulton. She was a member of the Reformed Presbyterian Church, Fulton. 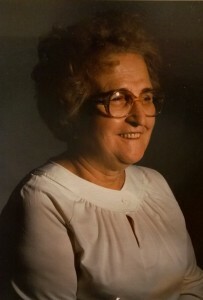 Mrs. Iamaio was a great cook and she loved to cook and share meals with her family. Her family felt that she had a heart of gold. Mrs Iamaio was pre-deceased by her husband John Iamaio in 1978, several siblings and son-in-law Don Kidd Sr. She is survived by her children: Theresa (Jim) Weinhold of Fulton, Tony (Joyce) Iamaio of Fulton, Michael (Martha) Iamaio of FL, John (Betty) Iamaio of Webster, NY; Nick (Kathy) Iamaio of Minetto, NY; Tom (Becky) Iamaio of FL, siblings: Tony Corsoniti of Fulton, Rose Tenery of FL, Mary Latino of Fulton, 14 grandchildren, 30 great grandchildren and several nieces and nephews. Burial will be held in the spring at St. Mary’s Cemetery, Fulton. Calling hours will be conducted 3:00 to 6:00 PM Monday at the Sugar Funeral Home, Inc., 224 W. 2nd St. S. Fulton. Nicky’s family would like to extended their sincere gratitude to the staff at Michaud Residential Health Services especially the 2nd floor staff for their respect and compassion that they always extended to their mother. A beautiful picture of Aunt Nicky, My favorite memory of her was her smile. No matter what, she always seem to have a smile. It was contagious. So sorry for your loss. I’m so sorry about the passing of your mother (in-law), and I’m sure she will be missed very much. She had a beautiful (and large) family that loved her. Our deepest sympathy goes out to the family of Nicky Iamaio. My deepest sympathy to you all. I will always remember your Mother as sweet, kind and very loving. The times we shared as kids are some of my fondest memories. My prayers are with you at this sad time. Theresa, so sorry about your mother, I remember the stories you would tell us about her. Thinking of you at this time. I am her great grandson and yes, she made the best spaghetti and meatballs.